If you’re a computer technician, the computer geek in your street or just a user who likes to play around with Windows, something you’ll face quite often is re-installing the operating system. Assuming installing Windows itself goes without any problems, the nightmares can really start when Windows doesn’t have generic device drivers for some of the hardware components. You need to identify the brand and model of the hardware and sometimes you even need to look for drivers using another computer when there aren’t any driver CD’s to hand. When using a slow Internet connection it can take ages to even find a driver for a specific hardware component never mind downloading it, which could be in the hundreds of Megabytes. A simple solution is having a program to make installing Windows drivers an automated process which can be done from the local computer without having to use to the internet if you can help it. If you already have just about all drivers that would be needed for almost any machine stored on a CD/DVD or USB flash drive, it would take the hassle out of you finding, downloading and then installing them yourself. Here are 3 solutions for installing device drivers in Windows from a local source. DriverPack Solution is a popular Russian program to automatically install drivers for Windows XP, Vista, 7 and 8 for both 32-bit and 64-bit. It greatly simplifies the process of updating your system drivers or any other computer that needs new drivers installed. The program bases itself around the popular DriverPacks set of compressed drivers which are packed with 7-Zip and contain thousands of different drivers for just about any piece of hardware. DriverPack Solution comes in two flavors, a Lite version and a DVD version. The Lite version is only around 10MB and doesn’t include any driverpacks, you select which packs you want from the program and they download via bittorrent. The DVD version comes as a 4GB+ pre-built ISO image with all the driverpacks included which you download also via BitTorrent and burn to a DVD disc. The major problem we encountered was the full DVD version was extremely poorly seeded, never having more than 1 during testing. The Lite version is much quicker because it uses the official DriverPacks torrents which have more seeds and will download far faster. The program will automatically scan for any drivers that need to be installed or can be updated. If missing drivers are found, simply click Update All, or if you want to see and control what’s installed, tick the Settings box, then tick Expert Mode. 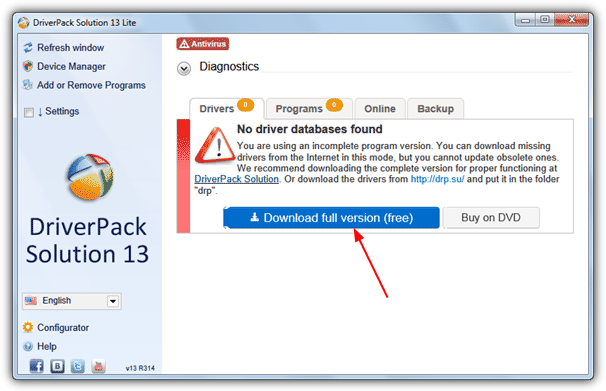 If you downloaded the Lite version the required driverpacks will need downloading. Do note that even if you choose to download no drivers at all, there’s still 700MB+ of updates, 3rd party programs and touchpad drivers which download by default and can’t be disabled. Once you have downloaded the driverpacks they will be stored in the default location of “C:\DriverPack Solution” and the contents of the folder can be copied to USB flash drive or burned to a CD/DVD. 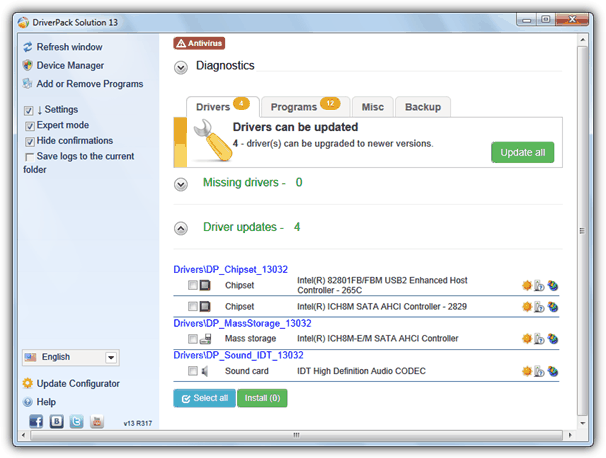 There is also a diagnostics option in the DriverPack Solution window which provides some basic information about your computer, a CPU temperature monitor, hard drive low space warning, a memory test and disk defrag. The system cleanup and antivirus options are really nothing more than affiliate links to other 3rd party software. A few other features on offer are a backup tab that can backup all the drivers in use to an executable file for restoring again later, and a Programs tab which offers to install a few Windows and 3rd party utilities. During early releases DriverPack Solution used to change your browser Home page without asking, but this no longer happens and you get offered adware during the Lite version install instead. Although the DriverPacks driver archives are still the standard way to get hold of Windows drivers in compressed form, their DP Base utility is all but useless for this task now because it only supports creating a driver disc for XP, and then hasn’t been updated since 2010 to reflect newer updated packs. In their forums, a developer and forum member have created a batch script that works on Window XP, Vista and 7 (and 8 if you can find some DriverPacks) which will auto install the correct drivers from the DriverPack archives for your system. All you need is to download the packs you want and place them in the correct location. Here’s how to do it. 1. Download and extract the Stand Alone Driverpack utility (SAD 2.5) from the DriverPacks forum thread. The file is a 7-Zip archive so you need a compatible archiver to extract it. 2. Go to the DriverPacks website and download the packs you want. All DriverPacks are only available as torrent files these days, so you will need a torrent client to get them or use an online service such as BitLet. 3. Once you have all the needed DriverPacks, they need to be copied into the correct folders inside the SAD folder. XP DriverPacks – go in the NT5\x86 folder. Vista/7 32-bit DriverPacks – go in the NT6\x86 folder. Vista/7 64-bit DriverPacks – go in the NT6\x64 folder. There will be an example dummy 7z file in each folder. 4. After this, the contents of the whole SAD folder can be copied to hard drive, USB flash drive or burned onto a CD/DVD. When you want to install drivers simply run the DP_Install_Tool.cmd. You MUST run the tool as administrator. 5. The tool will ask you a few questions before extracting and installing the drivers. First it will ask if you want to keep the drivers after install. Yes is useful to keep the drivers for future reference. The next question will ask if you want to create a restore point. 6. Next you will be asked of you want the drivers not required by the system to be removed, press Y so it doesn’t extract non related driver archives. 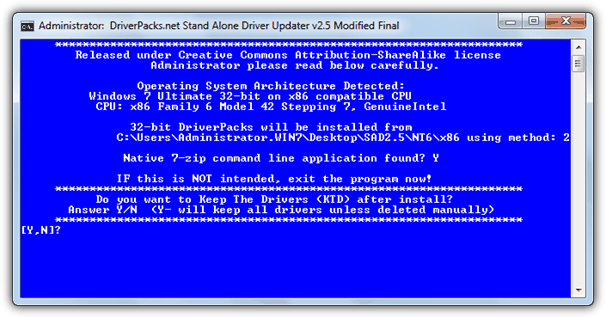 The tool then extracts the needed DriverPacks to C:\D\ and then installs the needed drivers. This may take a few minutes and you will be asked to restart the system afterwards. DriverForge is a program that will automatically install all drivers from a specified location onto your Windows XP install. The tool actually works in quite a similar way to the DriverPacks script above and extracts the drivers from the DriverPacks archives and then installs them, but does it from the comfort of a graphical interface. It’s known not to be compatible with Windows Vista or 7. Here are the steps to do it. 1. Download DriverForge and place it in an empty folder. 2. Go to the DriverPacks page and download the packs you want. It can be anything in the Windows 2000/XP/2003 (x86) DriverPacks section but remember the files need to be downloaded using bittorrent so could take a while. Copy the downloaded .7z packs to the same folder where you put the DriverForge program. 3. You can then either burn the whole DriverForge folder to a CD or copy it to a USB flash drive. When you want to install drivers on a system, run the DriverForge tool. 4. Check “Restart when completed” as Windows usually requires a restart after installing drivers, and “Delete uncompressed drivers when completed” if you want to save some hard disk space. In the “Path to Compressed Driver Files Location” box, browse for the folder where DriverForge and the DriverPack files are located. 5. Click the Start button and it’ll automatically extract the drivers to install and then install them. Ray I did it and everything is OK far as drivers. Hey thumbs up Ray.I will be rolling on Facebook. You are the best bro… you helped me a lot..
can we add more programs to driver pack solution? as avast , unlocker etc etc ? can any1 explian how to do ? This thing is freaking great, please never stop updating IT! wow…it works! great info’s very informative. keep the good work. This thing rocks. I’m not an IT person and not really system savvy, but this thing was incredibly easy. I thought I’d have to pay someone to do it for me, but you guys saved me $75. Thanks. This is pure genius! Thanks Raymond! Thanks for this tips raymond. I have been reading your blog for quite some time now and i just want to say thanks for all the tips and information you have given. More power to your site and keep up the good work.